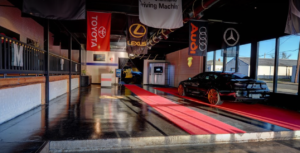 MTK Premier Auto Boutique prides itself on its luxury indoor showroom, unlike any other in the heart of Richmond. But perhaps its greatest assets are its consultants, who are passionate about automobile excellence and conduct one-on-one meetings to determine clients’ automobile needs. The auto boutique operates under a revolutionary business model: Instead of stocking inventory, consultants find their clients custom, premium pre-owned automobiles specifically to meet their needs, whether it’s a luxury, sport, economy or classic vehicle. With the support of Virginia Community Capital, this innovative small business will be able to continue to offer unique, highly-personalized automobile services to the community, while working under a financial model that allows continued success. VCC provided much-needed financing to MTK Premier Auto Boutique for the small business owner to purchase the real estate that the business has been renting for three years. The project utilized SBA financing (25-year term amortized over 25 years) to buy the property, instead of continuing to rent. The automobile business will now be able to continue to thrive in the resurgent and emerging Brookland Park Boulevard area, a section of Richmond that has struggled to support and house small businesses in the recent past. Before reaching out to VCC, MTK Premier Auto Boutique contacted numerous other financial institutions, but the borrower was unable to secure financing elsewhere due to complexities between the various parties. However, VCC was able to meet the auto boutique’s loan needs our attention to detail and ability to adapt to the needs of our clients. VCC values businesses like MTK that are important to their communities, and we work with them on a personal level to help them continue to thrive. VCC has a mission to help businesses in underserved markets, and this loan was a perfect fit for our model.